Celebrate the new year with a brunch for you and your favorite girlfriends! 2016 has arrived and the first thing on your mind, besides changing out of the party attire that you fell asleep in, is hunting for food and tons of it! Instead of getting dressed, driving across town, paying for parking, elbowing your way through a crowded line and waiting to be seated at your favorite cafe, why not stay in? Your fridge is fully stocked and this year is all about creating ways to have fun while on a budget. Text your favorite BFFS and host a New Year’s feast of delicious cocktails, comfort fingers foods, laughs and a killer playlist! Everyone knows the answer to any hangover is a brunch and we have enlisted expert foodie and culinary maven Chanel Murphy on how to host the perfect fete. So celebrate 2016 with a few of Chanel’s favorite meals (and a cocktail, of course) to create new memories for a new year. Enjoy! Place chopped strawberries in the bottom of the champagne flutes. In a pitcher, mix mango juice, pineapple juice, and champagne. Fill the champagne flutes with the mimosa. Garnish champagne flutes with remaining strawberries. Refrigerate remaining mimosa. Thoroughly rinse the chicken cutlets and season with salt, pepper, paprika, and garlic powder. Place in refrigerator and let chicken marinate overnight. When you are ready to fry the chicken, dip the chicken in flour. Beat egg with milk and dip chicken into the mixture. Afterwards, dip the chicken into the panko breadcrumbs. Heat the canola oil on medium-high. Afterwards, fry chicken for approximately 3-4 minutes on each side until golden brown. For the waffles, combine flour and baking powder. Season the mixture with salt and pepper to taste. In a separate bowl, combine buttermilk, melted butter, and eggs. Mix the wet ingredients with the dry ingredients. Add cheddar cheese into the mixture. Pour the mixture into a heated waffle iron and cook for approximately 4-5 minutes. In a saucepan, mix maple syrup and sriracha. Simmer on medium-low for approximately five minutes. Cut each waffle into quarters. 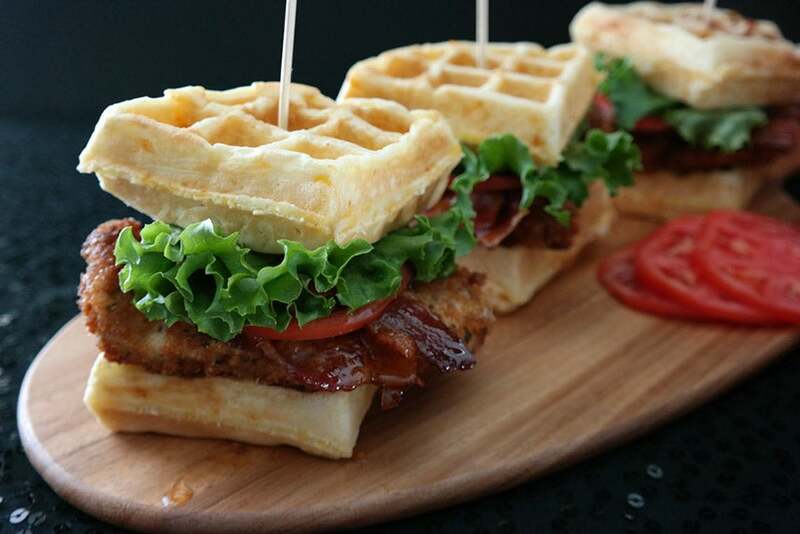 Place chicken onto waffle quarters and drizzle with syrup. Top chicken with sliced tomatoes, lettuce, and bacon. Top with remaining waffles quarters to form sandwiches. Drizzle sandwiches with additional syrup if desired. Preheat oven to 350 degrees. Beat eggs with milk. Season mixture with salt, pepper, and garlic powder. Afterwards, mix in spinach, bacon, shrimp, and cheddar cheese. Pour mixture into an 8-inch pie dish. Place cherry tomatoes on top, and sprinkle with additional cheddar cheese. Bake the quiche for approximately 45-50 minutes or until egg mixture has hardened. Garnish with chopped green onions. Preheat an oven to 325 degrees Fahrenheit. In a mixing bowl, combine flour, sugars, baking powder, and butter with a mixer on a low speed. Whisk in milk, vanilla extract, and egg. Afterwards, fold in crushed pineapple. Fill regular sized cupcake liners in a muffin pan about halfway full with batter. Bake for approximately 18 to 20 minutes. After the cupcakes have baked, let them cool for approximately 30 minutes. While the cupcakes are cooling, prepare the coconut buttercream frosting. Using an electric mixer, beat butter, cream cheese, vanilla extract, and coconut emulsion on a medium speed. Add in crushed pineapple, and continue to blend mixture until creamy. Afterwards, gradually add two cups of powdered sugar, and beat on a high speed until buttercream is smooth. Pipe buttercream frosting on cooled cupcakes with a pastry bag. Top cupcakes with maraschino cherries, toasted coconut flakes, and/or pineapple slices if desired.